New original album Toki no Tsubasa now on sale. The new ZARD the BEST site has moved to www.zard.f2s.com. This site here will still be available in its current state, but won't be updated anymore. A new ZARD the BEST is coming and it is located at http://www.zard.f2s.com. I've been working on it the past few weeks but it still isn't finished yet. I did find out that it is hardly impossible to keep working on that new site and at the same time updating this one here. So I think I will open it very soon, ready or not. At midnight Japanese time, ZARD opened the door to their special anniversary website. Once inside you will see a navigation menu on the right with clear descriptions of the	several sections in the site. I suggest you go have a look at the website yourself, but be sure to visit the album songs introduction here, where you can already sample 3 songs from the album: Get U're Dream, Madono sotowa Monochrome and Makenaide remix version. Additionally, at Zard's normal anniversary website you can write another birthday message; the purpose of it is not clear yet, but I think the messages collected from there will be used for the official opening of the website at February 10th. So, to be on the safe side, I suggest writing your birthday message in twofold (one for I-mode, one for normal website), whether or not different from each other. The things you need to fill in are (from top to bottom): name, name in Japanese, e-mail, postal code, address, gender, date of birth (y/m/d) and your message to Izumi Sakai. Zard Fan Room has put up a sample version of the song Tokino Tsubasa. The quality of the sample is excellent, but too bad it last for only 30 seconds. Visit Zard Fan Room or click here for a direct download (469KB). 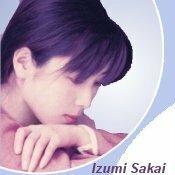 What was Zard's best song of year 2000?